Staying at a hotel that offers free breakfast is a terrific way to save money and time, because you don’t need to run around looking for your morning meal or spend a fortune! Some hotels offer free breakfast to everyone! But you can often get a fancier, more substantial meal when you have hotel elite status. And you might be surprised to find out you can earn status which gets you free breakfast with a single credit card, like the Hilton Honors American Express Ascend Card, The Hilton Honors American Express Business Card, The Platinum Card® from American Express, or The Business Platinum® Card from American Express. You don’t need to be a frequent traveler or spend tons of money to get in on this perk! Let’s take a look at which hotels offer free breakfast. We’ll show you the best chains to look for and how you can do even better by earning elite status with credit cards! Which Hotels Offer Free Breakfast? Most hotels charge extra for breakfast, but there are moderately priced chains that offer free breakfast for all guests, making a stay at their hotels an even better deal. Upscale hotel chains tend to require elite status for free breakfast, but we of course found which ones stand out in this category too. Hilton offers free breakfast across many of its value-based brands, while their more premium brands require elite status to earn free breakfast. Other Hilton brands will have breakfast available for an additional cost. But folks who have Hilton Gold or Diamond elite status earn free breakfast at all Hilton hotels! 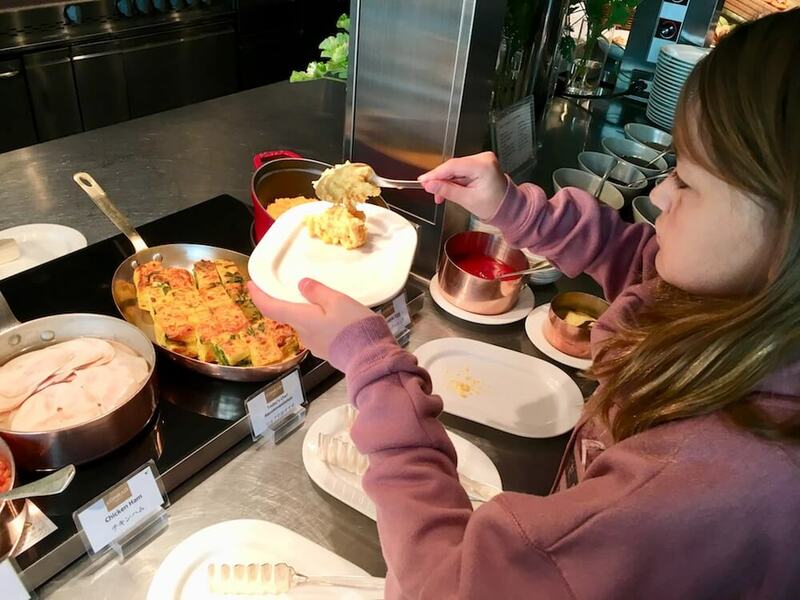 Team member Jasmin and her 3 kids stayed at the Conrad Tokyo earlier this year, where they have an incredible breakfast buffet. Had they paid cash, it would have cost $140 for the 4 of them, but it was free because she has Hilton Gold status from The Hilton Honors American Express Business Card. Here’s our review of the Hilton Honors American Express Ascend card. And our review of the Hilton Honors American Express business card. You”ll also earn Hilton Gold status when you have The Platinum Card® from American Express, or The Business Platinum® Card from American Express. It’s one of many outstanding, money-saving perks you’ll get with these cards! Check out our review of the AMEX Platinum and review of the AMEX Business Platinum to find out more! One big caveat with the free breakfast at Hyatt Place is that they require you to be a World of Hyatt member and to book your room directly with Hyatt. You don’t need to have elite status with Hyatt – just being signed-up as a member will be enough to satisfy the requirement. Unfortunately, you can’t earn Hyatt Globalist status directly from a credit card, like The World of Hyatt Credit Card, which comes with Discoverist status only. But folks with a lot of Hyatt stays might consider the card to put them over the threshold for earning Globalist status, because you’ll earn 5 qualifying elite night credits each year, and an additional 2 qualifying night credits for every $5,000 you spend on the card. The good news is that Hyatt breakfasts tend to be very good quality, so earning free breakfast here can really be worth it. IHG offers many different hotel brands targeted at all types of travelers. Only 2 IHG brands offer free breakfast for all guests. I actually think that Holiday Inn Express offers quite a lot of value and options for free breakfast, especially at their price point. Their cinnamon rolls are delicious! Million Mile Secrets team members are big fans of Staybridge Suites hotels. Scott in particular enjoys the free breakfast buffet and evening socials with complimentary food, wine, and beer at some locations! Unfortunately other IHG brands offer no means of getting free breakfast. Even for elite status members! Hopefully IHG will up their game with this in the future. To enjoy free breakfast at one of Marriott’s other brands you will need to have high elite status. 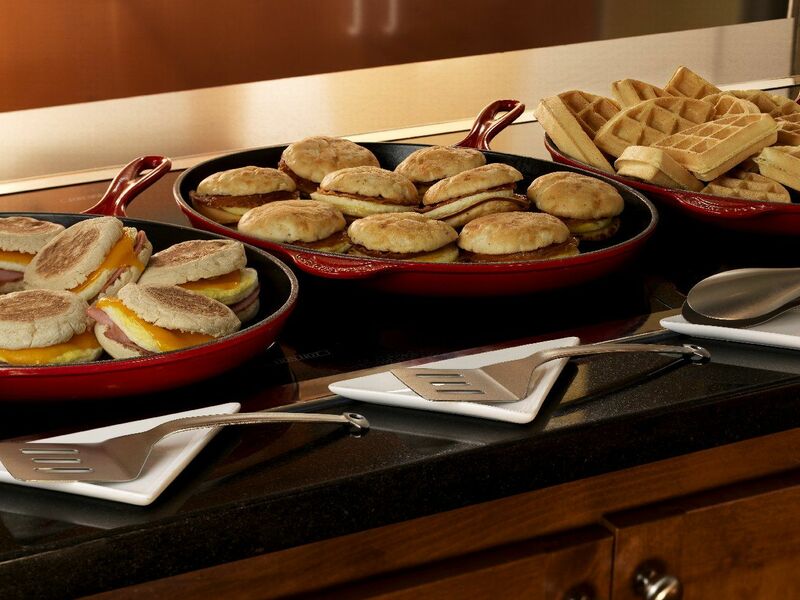 Marriott Platinum elite status members can get free breakfast at most other Marriott hotels. As a rule of thumb, Best Western hotels are proud to offer free breakfast to all guests. They offer this at any Best Western, Best Western Plus, or Best Western Premier hotel. There are also some options for travelers on the run, like fruit and granola bars. This makes Best Western a good choice for budget-minded folks, especially families! Choice hotels are great value options, and really good for road trips – you can find them even in smaller towns and spots off the beaten path. They offer free breakfast at many of their hotel brands. 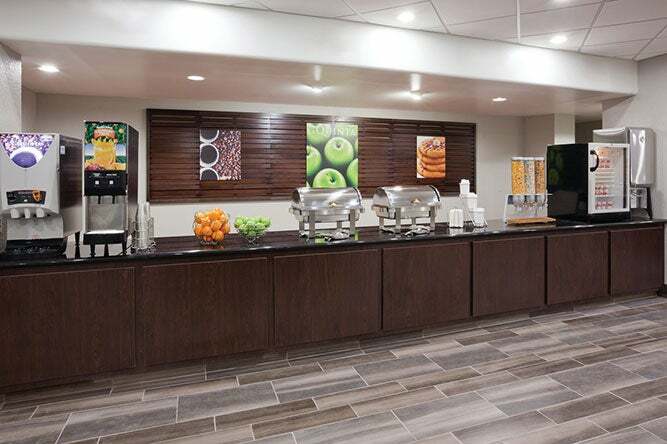 Some other Choice hotel brands like Rodeway Inn or Clarion will often have breakfast at specific locations, but don’t offer it as a brand-wide perk. Check the location’s page before booking to see if it is offered for that location. Earning breakfast at Radisson hotels is a bit more sporadic. 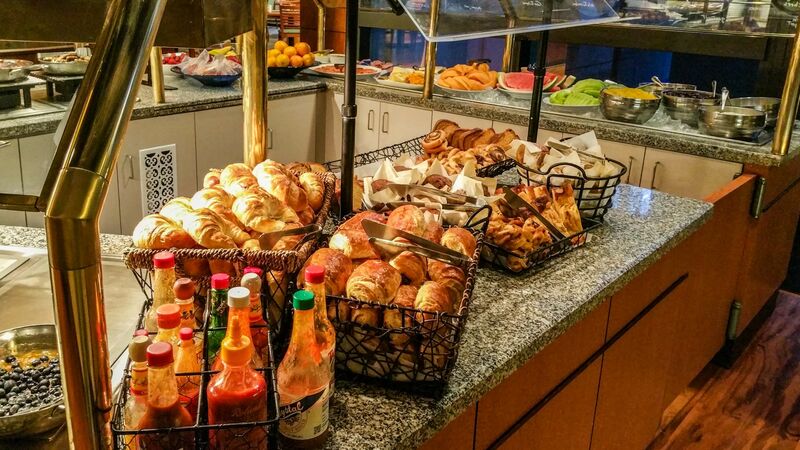 There are definitely many Radisson hotels that will offer free breakfast, but this tends to be left up to local management and is not something that is ironed out chain-wide. Many of the upgraded rooms (such as “Business Class” at Radisson Blu) do include breakfast as part of the room rate, but having elite status and earning a room upgrade doesn’t guarantee that breakfast will be included with the upgrade. As a rule of thumb you will want to check each hotel location’s individual site or call ahead to see if free breakfast is included with the stay, because it varies based on location. One exception is Country Inn & Suites, which offers free breakfast to all guests. 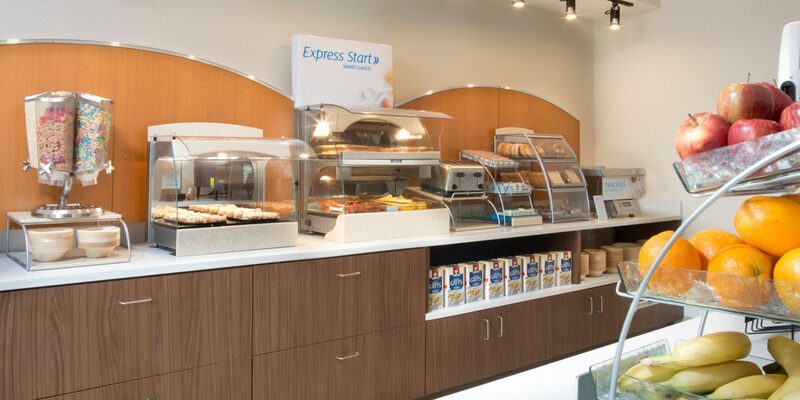 Most Wyndham brands offer free breakfast for all guests. So they’re another budget-friendly option if you’re looking to save cash! Unfortunately none of the other Wyndham brands (other than those listed above) offer any way to enjoy free breakfast. This includes with elite status from Wyndham Rewards. No tier of elite status offers this perk. Folks without elite status can still get a free breakfast if they have certain credit cards. One of the perks of The Platinum Card® from American Express or The Business Platinum® Card from American Express is access to the American Express Fine Hotels & Resorts program. When you use your Platinum card to book a hotel through this program, you earn a bunch of extra bonuses and perks during your hotel stay. One of the many perks you get is free daily breakfast for two! 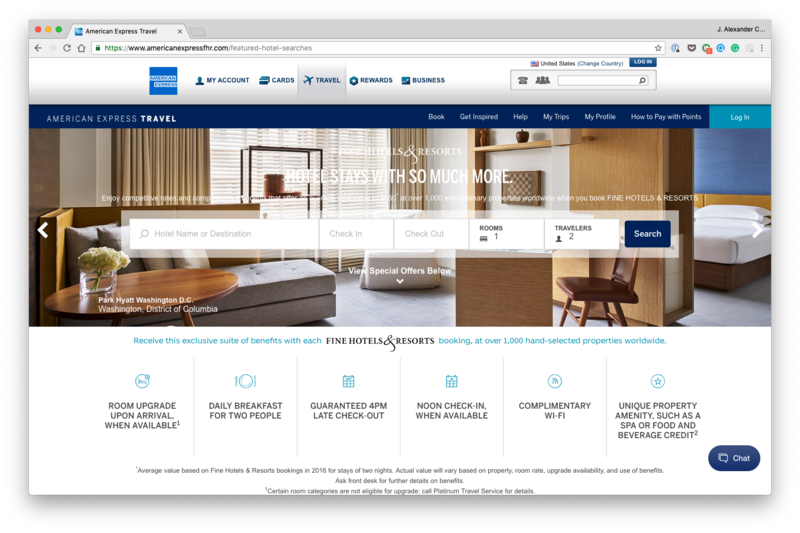 We really like using American Express Fine Hotel & Resorts portal because their prices are typically similar to booking through the hotel directly. And you’ll get other perks like a unique property amenity and guaranteed late check-out! If you have certain Chase cards, like the Ink Business Preferred℠ Credit Card or Chase Sapphire Preferred® Card, you can access the Chase Luxury Hotel and Resort Collection. When you use your card to book, you’ll get perks like daily breakfast for 2, room upgrades if available, early check-in and late check-out when available, and unique property amenities like hotel credits. 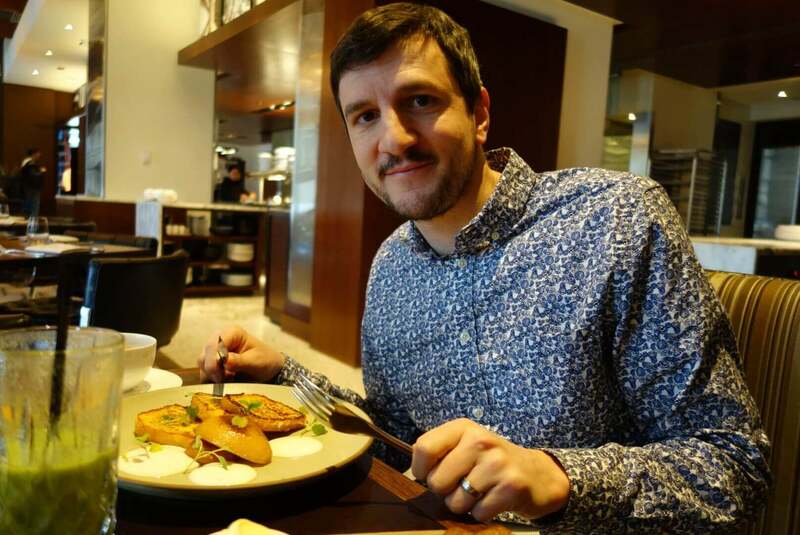 Team member Jason and his wife enjoyed an excellent stay at the Park Hyatt Chicago booking through the Chase Luxury Hotel and Resort Collection. Along with free breakfast (worth ~$70), they got $100 worth of dinner credit and a room upgrade! 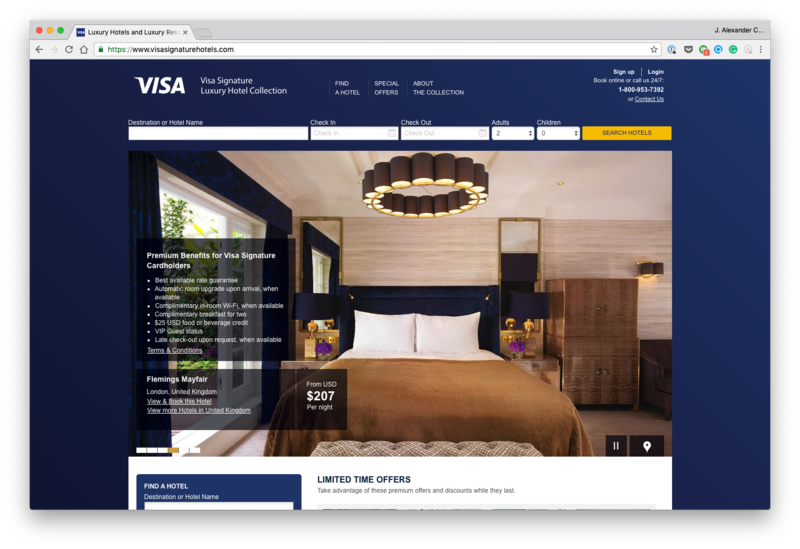 That said, if you have any Visa Signature card, you can book through Visa’s version of the program, the Visa Signature Luxury Hotel Collection. This entitles you to free daily breakfast for 2 at any hotel available on the site. In addition, you will earn a bonus $25 credit to use towards other food or drink during your stay. In my experience, the Visa Signature Luxury Hotel Collection doesn’t have as many hotels in their network as the AMEX Fine Hotels & Resorts program, but there are a lot more cards supported under the program. In fact tons of our favorite travel credit cards are Visa Signature. Hotels with free breakfast help you save money and start your day off right. 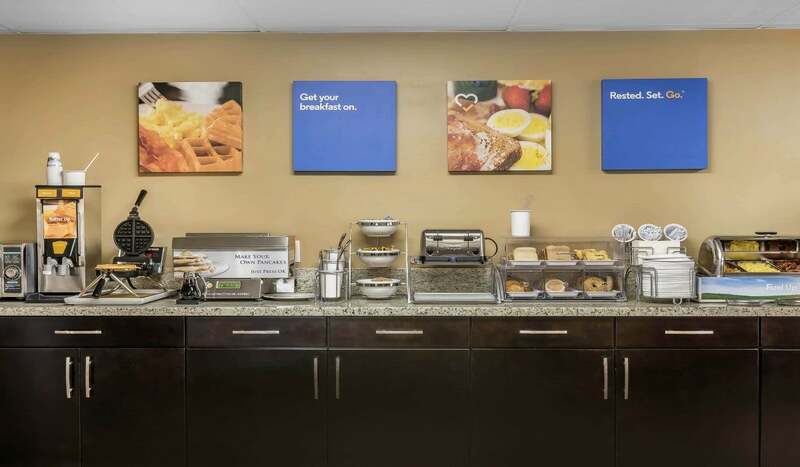 Some hotels like Best Western offer free breakfast to everyone, while others only offer free breakfast to elite status holders or at certain brands. For example, with Hilton Gold status (which comes complimentary with cards like the Hilton Honors American Express Ascend Card and The Hilton Honors American Express Business Card) you’ll get free breakfast at all Hilton hotels! Getting a free breakfast, especially if you’re traveling with others, can save a ton of cash. But if you don’t want to worry about elite status, you can still get elite-like perks by booking your hotel stays through the Chase Luxury Hotel and Resort Collection, AMEX Fine Hotels and Resorts, or Visa Signature Luxury Hotel Collection. Do you choose hotels based on whether or not you’ll get free breakfast? What’s your favorite brand? I had the best free breakfast ever at the Hilton Canopy in Portland! Artisan-style breakfast prepared with fresh, local ingredients. Lots of interesting choices to eat and drink! Embassy Suites (Hilton) has my favorite breakfast. Hot, made to order.